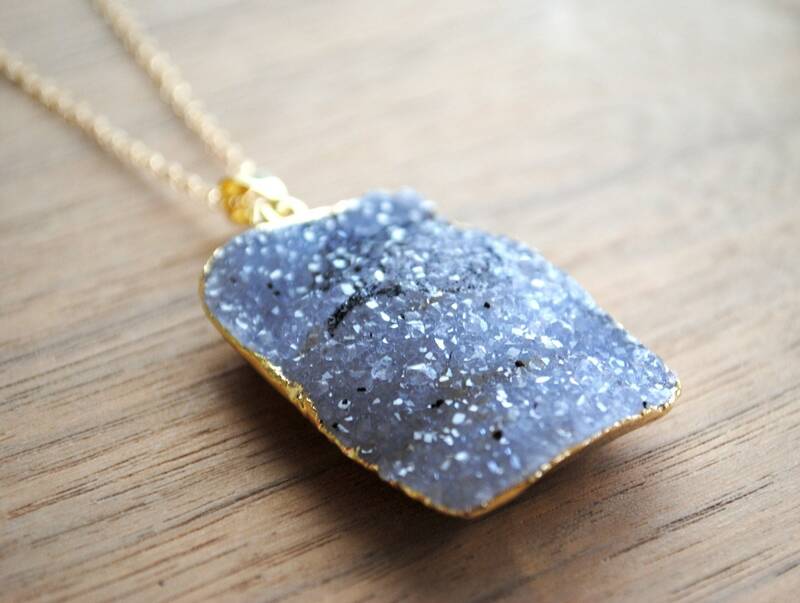 ⊿⊿ This necklace features a beautiful genuine natural druzy quartz that is rimmed in gold plating and it hangs from a delicate 30" genuine 14 karat gold filled chain. It closes with a spring ring. No extender is available and this is the only length it comes in. ⊿⊿ The naturally colored druzy stone is from Uruguay and comes in a few shades that range from a light, light grey/white to grey to a darker grey (actual color will vary from the colors on your screen). Druzy is a layer of crystal formations that develop on the surface of or inside a geode. The back of the pendant displays the natural surface of the other side of the stone. ⊿⊿ I have several of these available. Refer to the last images and make your selection at check out. The pendants are about 2" in length and 1" in width and each is unique and one of a kind and will feature natural variations/cracks/fissures/imperfections - all organic to the raw nature of the stone. ZOOM ⊿⊿ Use the zoom feature to get a closer look at item images. The reference photo showing necklace lengths is for REFERENCE ONLY. Body, size, torso proportions vary individually.